Description: : Our goal is for Emerald Eco-City to be the most pollution free city in the world, with advanced detection-and-correction technology to make it happen. Here is one deadly historical pollution example: American gasoline used to have tetra-ethyl lead in it to raise the octane rating AND oil company profits (lower-cost product sold at nearly the same price). Lead is a well-known deadly heavy-metal poison. If they only measure corporate success by bottom-line profits, then killing their customers slowly has never seemed to bother fossil-fuel heavy polluters before, or now. Tetra-ethyl lead was finally discontinued in the USA, when it was found that it damaged the expensive platinum salts in mandated catalytic exhaust converters. It is curious that we wouldn’t avoid lead in our gasoline to save the lives and nervous systems of thousands of babies, but America did eliminate leaded gasoline in order to save a piece of car hardware. In our corporate-profit-controlled corrupted society, catalytic converters must be worth much more than people. Tetra-ethyl lead is STILL used to make American 100-octane aviation gasoline. Piston airplanes are still polluting our skies with poisonous lead (more so around private-aviation airports). Tetra-ethyl lead is also still used in West Africa, where they do not have catalytic converters. 70% of the world’s chocolate is grown in West Africa, and is HEAVILY CONTAMINATED WITH LETHAL LEVELS OF LEAD. (2) the content of lead and other toxins in their deadly products for human consumption. USA sets precedents for the world to follow (like lead in many products, DDT, etc.). Even decades AFTER we realize how stupid we once were, and we discontinue their use, our international suppliers still send lead, DDT, etc. back to us in many things we import from them (including health-damaging lead paint in children’s toys, etc.). Just because our Spectacularly-Stupid Government recommends (or even subsidizes) something, does NOT mean that it is a good thing to do. Sometimes it creates havoc for decades, and in the case of nuclear-material waste, for millennia. John Holdren, Obama’s Science Advisor says that our current fossil-fuel subsides make no sense at all. Some were voted for by party-line-puppet Senator Obama. We should NEVER START deadly, inherently-unsafe, unsustainable things in the first place. Correcting previous errors, cleaning up toxic waste dumps, etc. is far more costly than the pennies saved and the profits made by badly damaging Earth’s delicate environment. When the many evils of American tetra-ethyl lead were widely published (after Earth Day 1970), a common question became: “How do we get the lead out?” – The simple answer is: DON’T PUT IT IN DUMMY! We will also block many documented carcinogenic cancer-causing agents from ever entering Emerald Eco-City. Avoiding deadly exposure is far less expensive than treating life-threatening cancer AFTER it is well-established. Antiquated, barbaric, radiation and chemotherapy save a few lives, but they also kill many patients every year. Most cancers are initiated or aggravated by avoidable man-made environmental toxins and well-known carcinogens. It is far better to AVOID cancer, than to undergo potentially-deadly cancer treatments. Emerald Eco-City will focus on TOXIN EXPOSURE PREVENTION wherever feasible. When we import products from outside Emerald Eco-City, suppliers will have to sign contracts to test-and-ensure that none of their products contain our list of banned toxins. (4) We will notify authorities about their toxic products, and we will publish our findings on the Internet (so they do not dump poisons on other unsuspecting customers). This is intentionally-harsh treatment for greedy killers. All violators are GUARANTEED to be caught. We will only do business with non-polluting companies of the highest PROVEN integrity. We hope to become a role model for everyone who seeks to become Emerald Green. Automated air, water, and sewage sensors at strategic points around Emerald Eco-City (including residential units) will continuously test for banned substances 24 / 365. When anything bad, banned, or illegal is detected, its precise source will be quickly isolated. Violators of our Never Burn Anything and Toxin Bans will be brought to justice and required to pay for health damage, clean up, and punitive damages. This will be made VERY CLEAR to everyone who seeks temporary-or-permanent access to Emerald Eco-City. It will be part of the LARGE PRINT in the online reservation and entry access process. Emerald Eco-City entry security will be tighter than in large airports today (including quick-test breath analysis for communicable respiratory diseases, and residual illegal substances). Visitors will be rejected. Residents will be quarantined in hospitals or their own home. Their movements and contacts will be monitored and fed into our 365 Epidemiological Health Computer Systems. Pollution (and detectable airborne diseases) will be strongly enforced by sensor automation and testing laboratory experts – Far more than anything the U.S. government or airlines do to protect our citizens today. The do NOT enforce existing, frequently-violated federal pollution laws. If any law is bad, remove it. If the majority wants the law to be in place, then ENFORCE IT. There should be no unenforced laws on the books in Emerald Eco-City. The laws will be agreed to by those applying for jobs, residence, or visitor-pass access, before they are allowed past our secure entry point (at the “Yesterday” end of our electric train). If a small quantity of a pollutant is discovered (e.g. smoking anything), it WILL be detected, punished, and our anti-pollution systems will be improved to prevent similar future occurrences. EMERALD ECO-CITY IS NOT FOR EVERYONE. We will make it very-clear that suicidal substance abusers will NOT welcome inside. Cities have the right to make their own laws. Emerald Eco-City laws WILL be enforced. Since we will ban the use of heavy metals inside our Eco-City, they should NOT be found in our sewer sludge. IF a banned substance is found, it will be removed by whatever means necessary. Our sensors will allow us to quickly identify the source, and deal with it with strong prejudice. If the violation was intentional, the source supplier will be banned from Emerald Eco-City, and any investment forfeited. Our cleaned-up sewer sludge will be processed by natural organics, high-temperature solar radiation, tested for pollutants, contaminants, and bad pests, and only then mixed with organic compost (plus fish trimmings, etc. ), deodorized, and used as safe, healthy natural fertilizer for our food. Problems like the White House lawn will NOT be possible. CHLORINE is a deadly toxic chemical. It can quickly kill almost all living things. Chlorine Poisoning occurs when humans or animals inhale chlorine, swallow it, or even just get it on their skin. In small quantities, chlorine (and chlorine byproducts like carcinogenic chloramines, etc.) can progressively damage health, induce pain, suffering, and eventually cause early avoidable death. There are a few chlorine compounds (like sodium chloride – NaCl – table salt) that are essential for nearly all forms of animal life. The salinity of human blood matches that found in the great oceans, from whence land animals once came. BUT for the most part, free chlorine (in many cleaning and water purification products), and most chlorine compounds (like Chloramines, Chlordane, Chlorophenols, DDT, DDE, Heptachlor Epoxide, Hexachlorobenzene, Paradichlorobenzene, PCBs, Perchloroethylene, 4-Dichlorophenoxyacetate, etc.) ARE VERY TOXIC TO ANIMALS AND HUMANS. Chlorine is commonly used (dangerously) in public water supplies, swimming pools / hot tubs, chlorine bleach products (very strong odor), and even as a Deadly Preservative in food, flowers, and some wood products (which are documented carcinogens). Chlorine and chloramines are easily absorbed through the pores of the skin. When you get out of chlorinated water from a swimming pool, bath tub, or shower, your skin has a strong smell from the chloramines, which are now circulating through your blood stream, with no biological filtering mechanism – Damaging all internal organs, and increasing your risk of many kinds of potentially-deadly cancer. Chlorine reacts with water in-and-out of your body to form extremely-poisonous HYDROCHLORIC ACID and HYPOCHLOROUS ACID. Deadly Chlorine gas is released when bleach containers are opened, or when naïve cleaning people mix bleach with some types of common cleaning products, or ammonia (producing lethal levels of CHLORAMINE GAS). Chlorine gas is released into your lungs when you open a container of bleach or swimming-pool chlorine tablets. Chlorine gas is especially strong in containers that have been sitting for several months (for example, the first opening of a new container or after a swimming pool has been closed for months). Partially-filled containers have room to build up more free chlorine gas than full containers. Your jug of chlorine bleach becomes even more health damaging when it is nearly empty. Most children quickly learn that exposure to intense midday sunshine quickly causes painful sunburns. Even on cloudy days, diffuse sunlight can burn the skin badly, which greatly increase the risk of skin cancer. One bad burn as a child can cause skin cancer decades later. It makes me extremely upset to see young parents allowing their children to get sunburned. THE PARENTS SHOULD BE PUNISHED AND FORCE TO ATTEND PARENT TRAINING PROGRAMS. Sunburn learning can take place in only a bad summer day, but what most parents do NOT understand is that BATHING IN ANY CHLORINATED POOL OR HOT TUB ALSO INCREASES THE RISK OF SKIN CANCER. If a child or adult gets skin cancer, you must ask: “Was it from a sunburn, or from chloramines, or a combination of both?” (which is very common in the summer). There are far-superior ways to purify water today that DO NOT USE ANY HARMFUL CHEMICALS. All swimming pool and water feature water in Emerald Eco-City will be safe to drink and soak in for hours. (17) Holes (necrosis) in the skin or tissues underneath. Long-Term Chronic Chlorine Exposure Symptoms include many forms of avoidable lifestyle-choice / environmental cancer, and increased risk for multiple internal organ systems failure, and early avoidable death. Why would rational people ever permit the use of such dangerous products? EMERALD ECO-CITY WILL NOT ALLOW CHLORINE OR OTHER TOXINS! (the firm flesh of embalmed dead bodies). Europe paid attention to scientific data about deadly Formaldehyde and banned all products that contain it. Emerald Eco-City will also make products containing Formaldehyde, or things that produce Formaldehyde, STRICTLY ILLEGAL. In contrast, America’s non-learning federal and state governments MANDATE the release of huge quantities of deadly Formaldehyde into our delicate atmosphere. They provide billions of dollars of SUBSIDIZES for the production of Formaldehyde. And, they encourage the use of Formaldehyde products by purchasing and distributing large quantities of products that contain extremely hazardous levels of Formaldehyde? Didja already know that? It this the kind of non-caring, suicidal government that should be telling you how to live your life? Let’s look at the specifics. Formaldehyde is a member of the deadly family of Aldehydes, which also includes Acetaldehyde . The U.S. Environmental Protection Agency (EPA) says that Aldehydes significantly increase the risk of cancer. Aldehydes are produced when biofuels (like ethanol and biodiesel) are oxidized (by burning or biological metabolism). 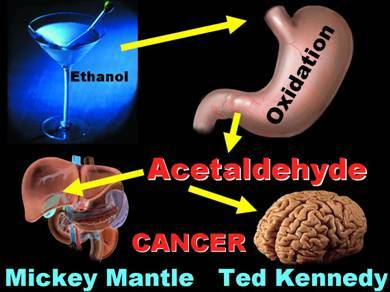 If you drink alcoholic beverages (containing ethanol), they metabolize into aldehydes, which in sufficient quantities, over a period of time, badly damage the liver (which killed Mickey Mantle), and cause brain cancer (which killed Ted Kennedy). When we burn biofuels (ethanol and biodiesel), large quantities of deadly aldehydes are released into the air we breathe, which enters our lungs and damages our internal organs, including the very-sensitive liver and brain. In many U.S. locations, and particularly in the winter, adding ethanol to gasoline is MANDATED. Even where it is not required, ethanol is added to gasoline for a variety of profit-motivated reasons. Americans have gotten used to using lower-quality gasohol, and paying high prices for it. The mpg / BTU energy output of ethanol is lower than pure gasoline (which emits far less aldehydes). When only 10% Ethanol Mix is added to gasoline (E10 “gasohol”, commonly sold in America), THE EMISSION OF DEADLY ALDEHYDES INCREASES 40%! E85 for “Flexfuel” vehicles (mandated by our insane federal government) is much worse. U.S. EPA says that Formaldehyde and Acetaldehyde are deadly. 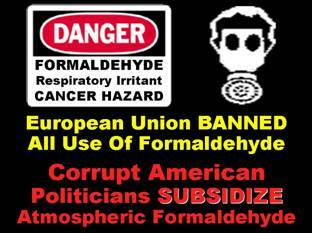 Why does our insane Congress MANDATE and SUBSIDIZE large quantities of environmental Aldehydes toxic carcinogens, when the European Union has BANNED THEM ALTOGETHER? We are most-certainly a non-learning IGNORE-ant nation. Emerald Eco-City is going to lead the American way toward ZERO Emissions, and ZERO Pollution. Most Aldehydes are VERY TOXIC to living things. Perhaps the largest aldehyde health risk source is cheap U.S. building-industry materials, and “wasWOOD” products like particle board, fiberboard (MDF), oriented strand board (OSB), plywood, paneling, cabinets, furniture, some plastics and veneers, countertops, floors, carpet, and in the bonding agent of common materials like fiberglass insulation. ALL OF THESE ARE INTELLIGENTLY BANNED throughout Europe and elsewhere, since they are known to cause potentially-fatal CANCER and other serious respiratory diseases. Modern American buildings are often filled with a diversity of bad, toxic, carcinogenic aldehyde products. Aldehydes (including Formaldehyde) are among the MOST COMMON BAD U.S. INDOOR AIR POLLUTANTS. Aldehyde VOC’s (volatile organic compounds) cause allergic eyes / nose / lungs, nose bleeds, coughing, difficulty breathing, low blood oxygen (blue fingernails), headaches, deadly cancer, and leukemia, especially in susceptible innocent children and the elderly. Is this what you want in your home or place of work? How long will it be before America bans this deadly practice? Our children’s health has already been permanently degraded. 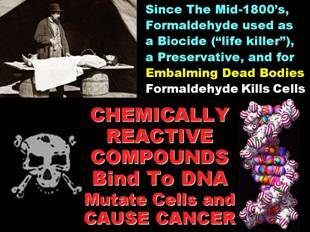 Aldehyde exposure health risk is cumulative and irreversible, just like the way Formaldehyde embalming fluid irreversibly cross-links protein amino acids, creating the firm flesh of embalmed dead bodies. There is no recovery from cumulative Formaldehyde exposure – It is slow death on the installment plan. Formaldehyde in our tissues: A century ago (when Americans were not surrounded by pervasive products that emit formaldehyde), it took twice as much embalming fluid to preserve a dead body as it does today. 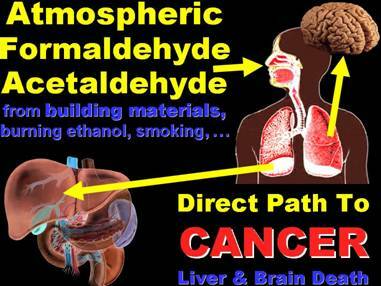 One reason is because we are now exposed to so much formaldehyde in the toxic American environment that our tissues are already half embalmed when we die! (Which is killing many at an earlier age.) This is no longer happening in more-intelligent Europe, which banned Formaldehyde products. Aldehyde Pollution – Spectacular Stupidity: The inept, slow-moving, catastrophically-mismanaged Federal Emergency Management Agency (FEMA - appointed by totally-unqualified Bush Administration imbeciles) was DEADLY-SLOW to respond to the Global-Warming Hurricane-Katrina New Orleans disaster (created in large part by poorly-designed-and-constructed, unsafe U.S. Corp of Engineers levies). Are YOU satisfied with the way Katrina was handled by FEMA? Eventually, FEMA provided mobile homes for Gulf Coast residents who were displaced by multiple powerful 2004 / 2005 (climate change) hurricanes. Many families living in FEMA homes immediately complained of breathing difficulties, nosebleeds, and persistent headaches. Despite the clear-and-consistent health-damage warnings, Formaldehyde levels went largely unmonitored. When the court finally ordered FEMA to test what they had wasted so much taxpayer money on, the FEMA mobile homes were found to have extremely high levels of deadly cancer-causing Formaldehyde, which has permanently-and-irreversibly damaged many adults and children. Over two years AFTER construction, the levels in FEMA homes were STILL TEN TIMES GREATER THAN U.S. EPA MAXIMUM SAFE LEVELS. The corrupt Bush / Cheney FEMA ACTIVELY COVERED UP their deadly poor judgment for years - When the homes were no longer needed by Gulf Coast residents, FEMA deceptively gave them to poor Native Americans. Most of the crooked FEMA criminals kept their cushy federal jobs, until Bush left office and beyond. Thousands of valid lawsuits were filed against our insane federal government. Our federal government tried to absolve themselves from the crimes they clearly have done, but the court correctly stated that FEMA is NOT above the law. Federal taxpayers must now pay for the Bush administration incompetently damaging our citizens, who were also injured by American-made climate change, caused by the crooked Congress subsidizing highly-profitable fossil fuel pollution. The lawsuit payments will increase the federal debt burden placed on our grandchildren long after the sinister Bush / Cheney administration left office, in addition to increasing long-term healthcare costs for the injured. The wicked web of pollution corruption is pasted down to many innocent generations. Anyone who loves their grandchildren MUST NOT ALLOW crooked corrupt taxpayer subsidies of deadly, unsustainable, suicidal pollution – No Compromise – No Excuses. Emerald Eco-City will carefully avoid Formaldehyde, and many other well-documented construction material terrible toxins. Radon is produced from the decay of many naturally-occurring radioactive material sources that are sometimes found in and around buildings. The United Nation's World Health Organization (WHO) says that radon is a worldwide health risk in homes. Dr. Maria Neira of WHO said that "Most radon-induced lung cancers occur from low and medium dose exposures in people's homes. Radon is the second most important cause of lung cancer after smoking in many countries." It is difficult to deal with high concentrations of radon after the source has been installed. Emerald Eco-City contracts with material supplies (like concrete) will specify that we will NOT accept radioactive materials. This will force the concrete companies to test the materials that they use (like crushed stone) to ensure radioactivity at a very-low level. Our onsite contractors will be provided with Geiger Counters to check material (like concrete) before it is installed. Engineers will test installed material to verify the previous checks were accurately and consistently made. Almost no other construction project has ever been this careful in preventing problems BEFORE it is too-costly to correct them.